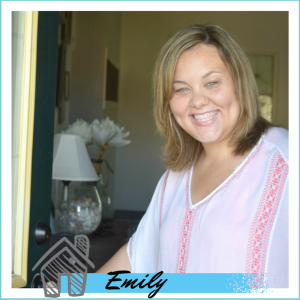 One of the biggest misconceptions people have always had when looking at my home is that they assume I spend a lot of money to decorate it, this could not be further from the truth. Now that I am decorating as my “job” which I use loosely because it feels wrong to call this a job. Still, I do decorate a little more than I would without this “job”. When we first purchased this home and I had champagne taste on a beer budget, I explained it previously as our budget was so low with home decor that the beer needed to be donated. I had to get creative with how to make my dream home happen. This included a ton of thrown at us pieces from family, side of the roads finds, and secondhand stores. 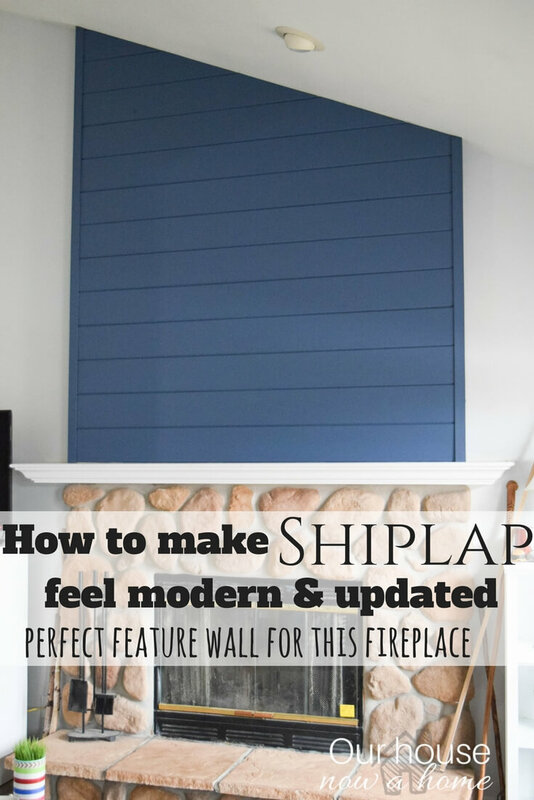 Today I am sharing one of those wonderful furniture upcycles that make my DIY and home decorating loving heart got pitter-patter. 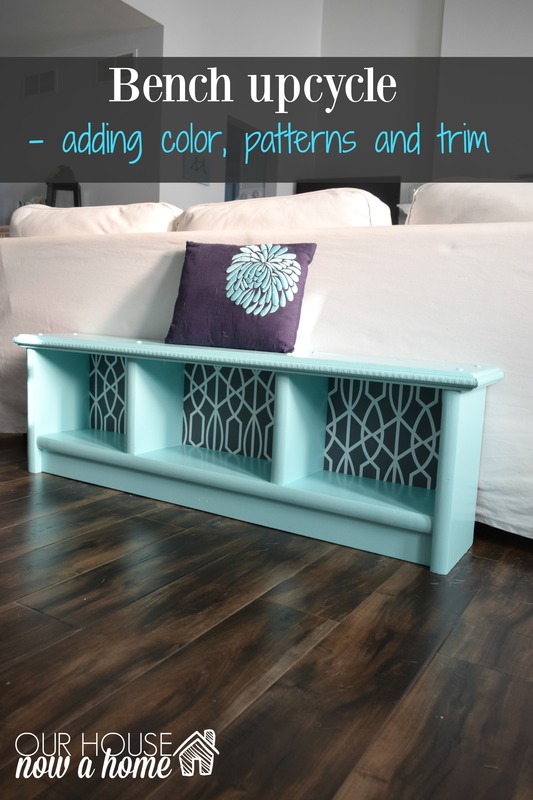 How to upcycle a bench, adding the details is what I am sharing today. 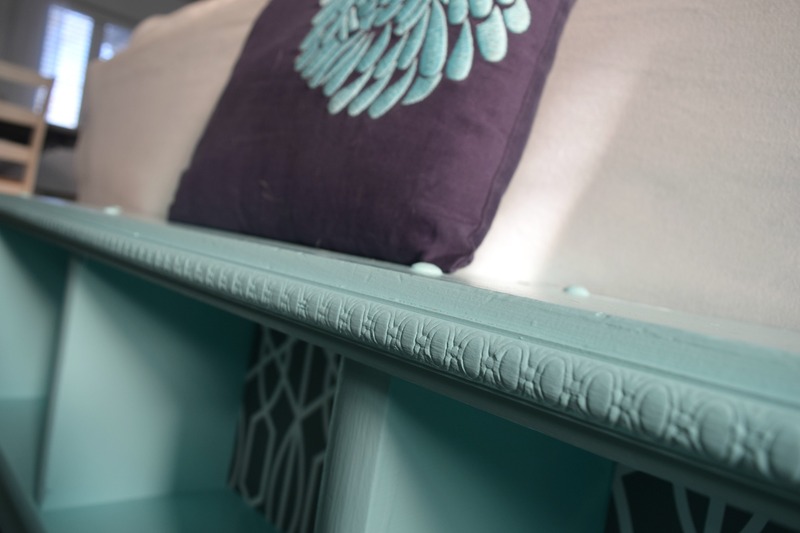 This little turquoise dream was a dark and tired looking piece, with just a few additions it is now the star in our entryway! Here is the bench in it’s natural habitat, when I rearranged our living room I created a tiny little entryway space here. 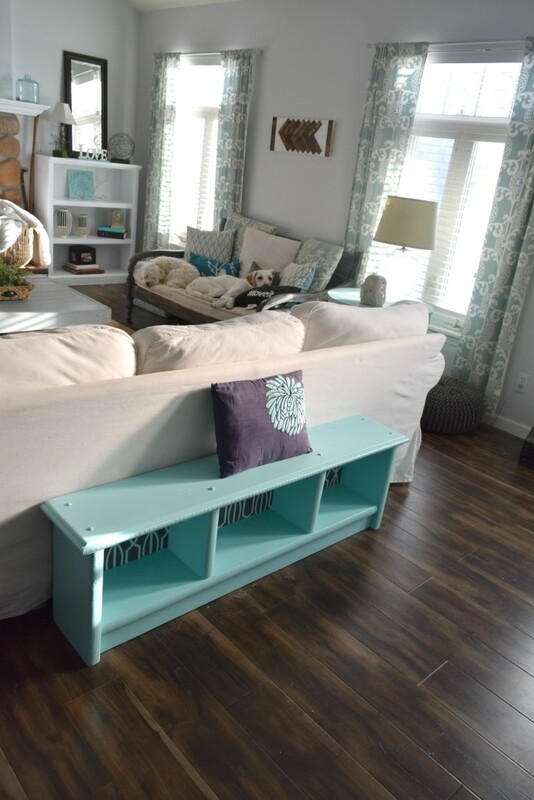 With the front door opening right into the living room there is only so much I could do, but this little bench does a wonderful job of having a place for people to sit, put their shoes or bag on. It sits opposite the console table I made, but with the console table being dark and industrial and the rest of this space having a bright feel I wanted to lighten up this space. The plan is to redo the bench and add a lot of details to it, take is from drab to fab! The first step in redoing furniture is to always sand the piece of furniture down, just enough to have the surface feel a little rough. 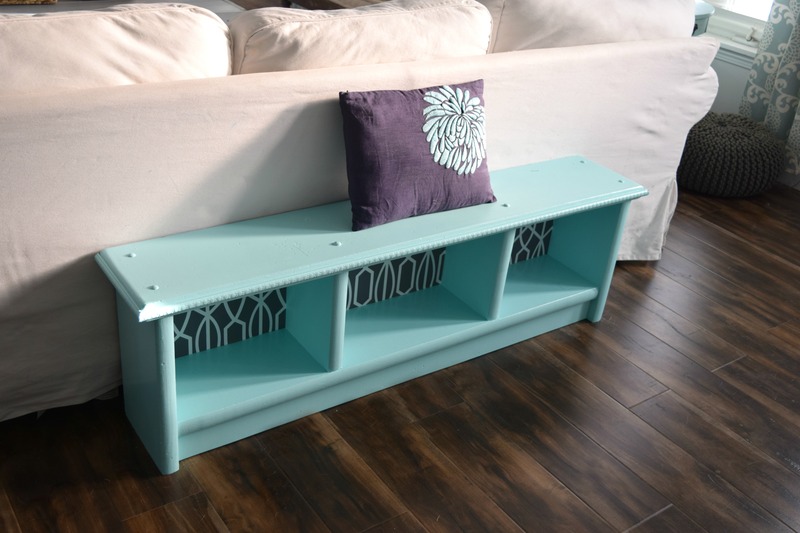 Because the original color of this bench is so dark from my goal of bright turquoise a primer is best to start with. This will allow full coverage of the bench. One coat of primer is more than enough to give me the coverage needed. 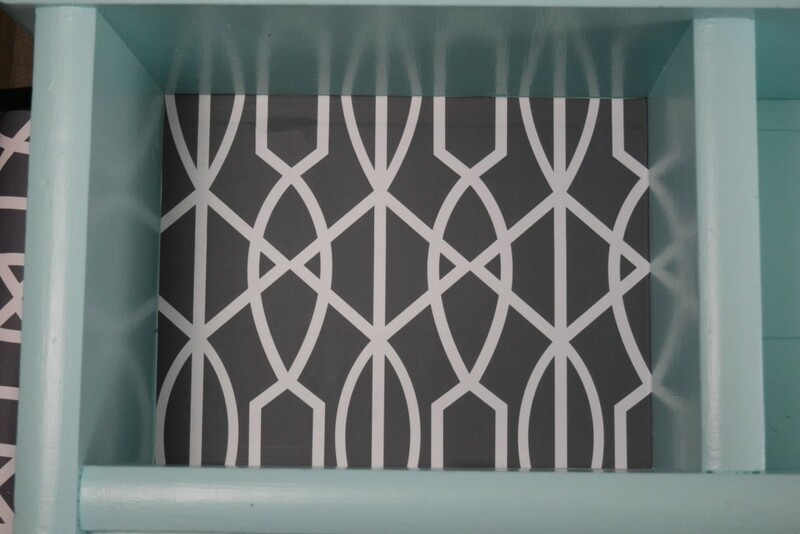 Before I start painting with my actual paint color I wanted to add some trim to this, a little extra fancy detailing. My decorating style as been described as casual and simple by others, and I agree with that. I do however love a little drama and pop of color. I purchased these trim pieces at a home improvement store. Measuring where they will be on the bench then cutting them down to size. The important step to take when doing a furniture piece like this is to make the new addition look as if it always belonged. You do not want to have the furniture look like it is a bunch of things thrown together. 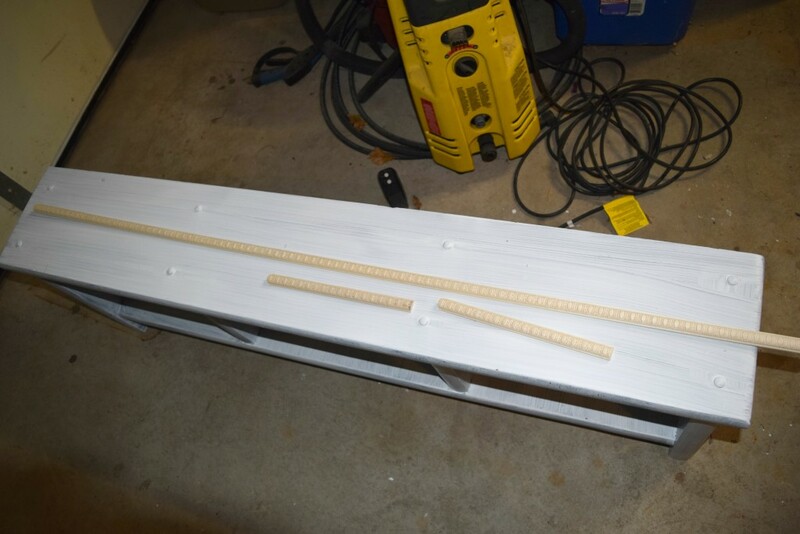 So my plan to make this trim look as if it has always been attached to this bench is to make the lines perfect. I want the corners to end in a 45 degree angle so that the corners can be flush together. This is achieved with cutting the initial piece longer then what I needed. Then lining up the trim on the corner and marking where it hits. Setting up your table saw and cutting along the mark. It sounds complicated, but I promise you it is not. 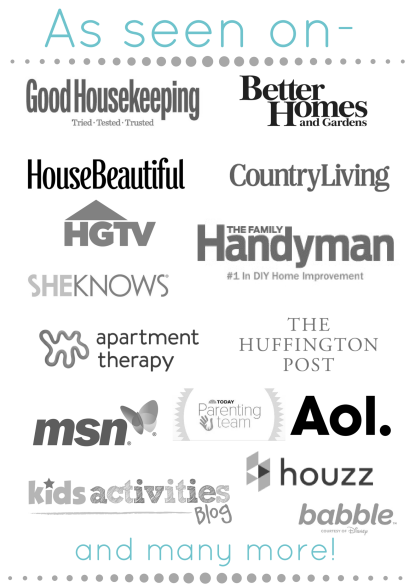 I started my DIY journey as a woman afraid of a hammer. I can use any saw thrown at me (not literally, don’t throw saws) and these cuts are really simple ones to make. 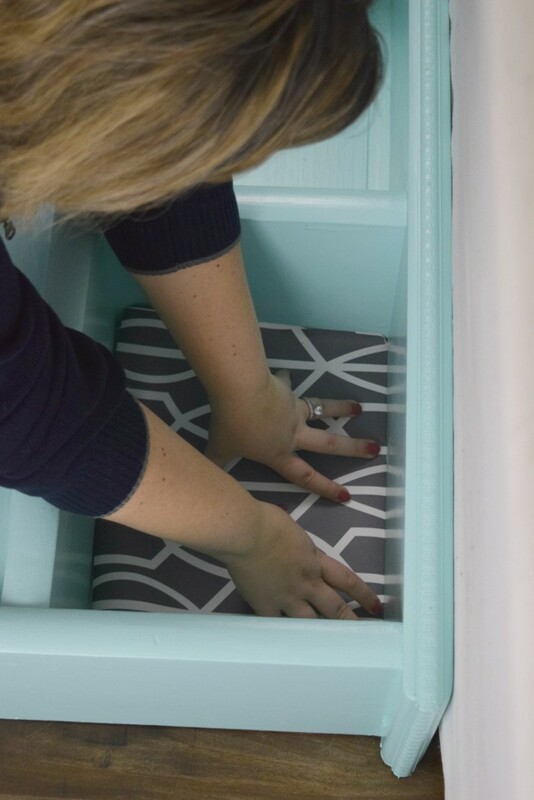 You can attach the trim piece to the furniture in a few ways. With a air nailer, which is what I used. Most do not have an air compressor though. 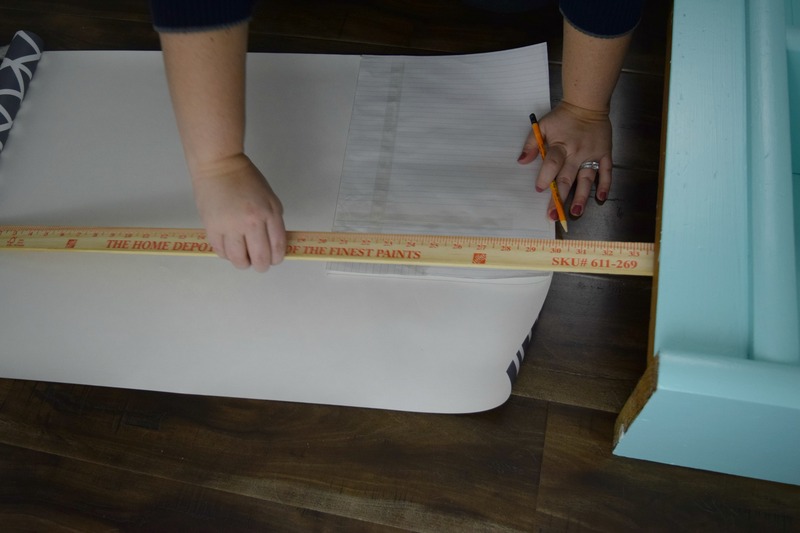 Depending on the width of your trim you can use a standard hammer and nails. 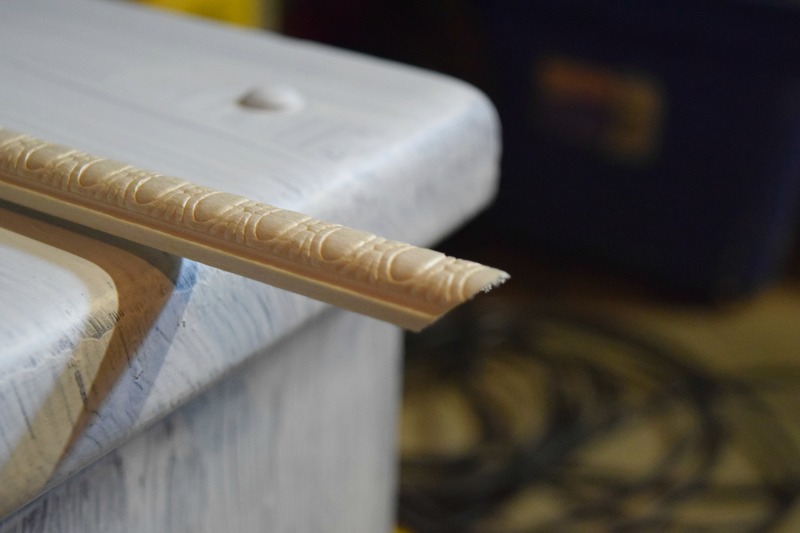 You have to be careful if your trim piece is somewhat thin when doing it this way because that can cause cracking in the wood. Wood glue and clamps are a great option as well. I did three coats of the beautiful turquoise blue. 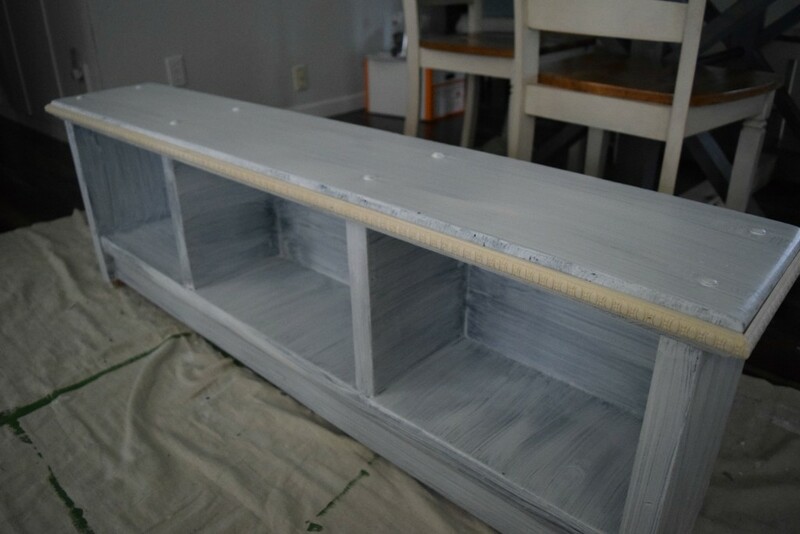 The key to painting a piece like this is to never rush it, do smaller amounts of paint per coat so that there is no visible paint brush lines. 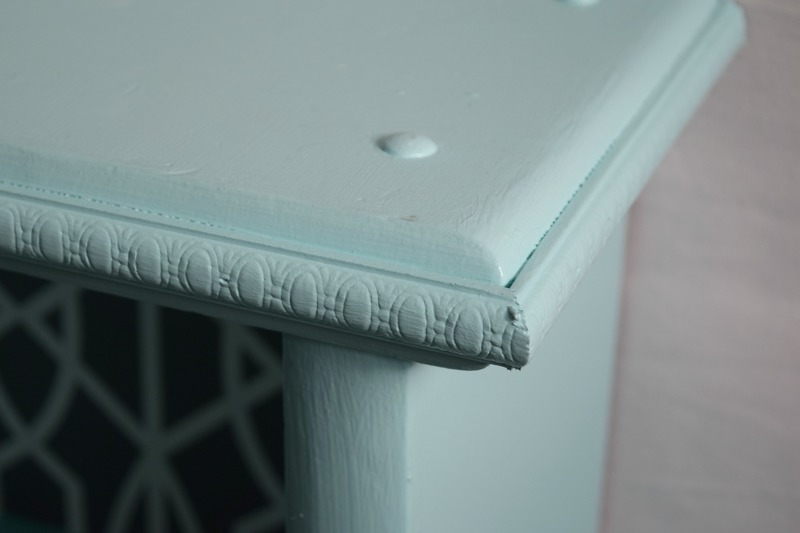 I also put a little less paint on the trim piece because I wanted the pretty circle details to show up. I set this up in time for Christmas and enjoyed my work. After a few weeks I felt like it was missing something. Yes, it was a pretty bench that still functions wonderfully, but it felt a little too formal. I needed to add something fun to it. My Husband Dale thought I was crazy and should leave it as is. I will mention, I never listen to him and am 98% of the time right. 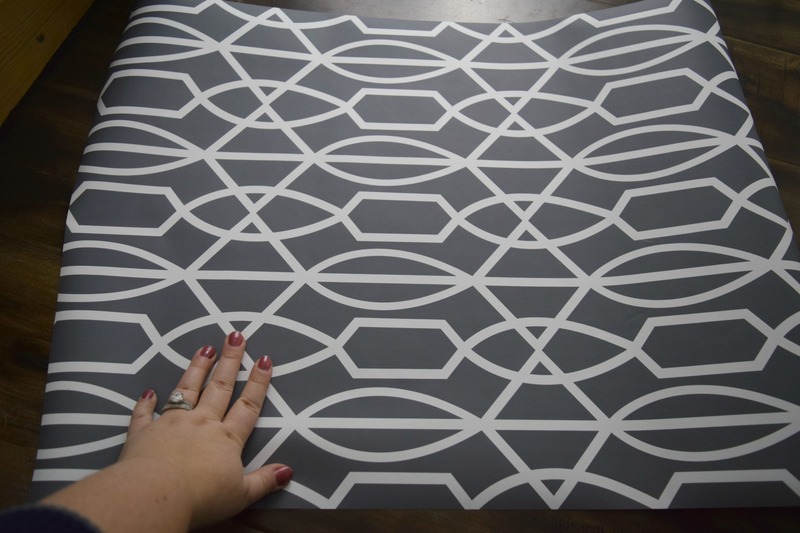 I saw this fun dark gray peel and stick paper at Target. I love the look of shelving lined with paper, and may do it to larger furniture later. I wanted to give it a try in my home first to make sure I like the effect. Spoiler alert, I love it! I thought the contrast of the light blue with the dark gray with the pop of white would be just the fun and modern feel I was looking to add to this. Here is where my obvious lack of formal training comes in, I have never wall papered before. I generally use paper for crafts, art or to make paper airplanes. All of which I am awesome at, especially the airplane making. This paper is designed to be quick and painless. The directions said to simply cut, peel and stick. With it being in a little cubby in the bench I could not lay the paper in and cut. 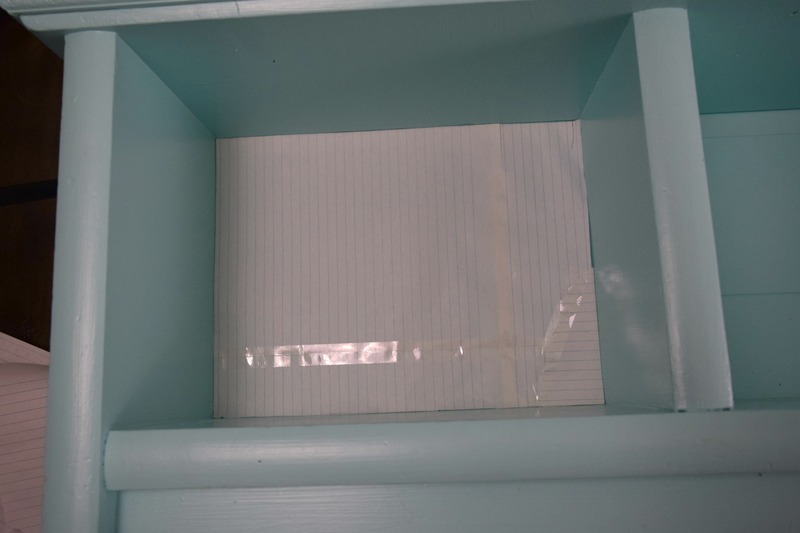 I taped some scratch paper together and then inserted that into the bench cubbies. Cutting it down to size, I used this as my template. With my template I traced on the back of the peel and stick paper with a ruler for extra precision. I had to do this process three different times because each cubby was a different size. I do not get to take the blame for that one, this bench was already built when I acquired it. With my lines drawn, I held my breath and cut away. I know I had a lot of the paper left, but I am a perfectionist and do not like to have to repeat things because I did not get it right the first time. No one has time for that! I set the freshly cut paper piece into it’s cubby. I had to use a razor from Dales pocket knife to cut a few edges of this. I did cut this paper a little larger than the template because I knew that I could cut the edges down to size, it left me room for error. Once I knew the paper was a good fit, I peeled off the back. I figured I was home free… peel, stick, done. Wrong! Adding details like this wall paper to a bench like this is difficult because of the tight work area I have. It was difficult to line up all edges in the tiny square without the stick portion getting stuck too soon. Luckily this stuff is amazing and I was able to peel off and try again a whole bunch. I finally got it right and for the sake of my reputation will not reveal how many tries I needed, it rhymes with shmillions. 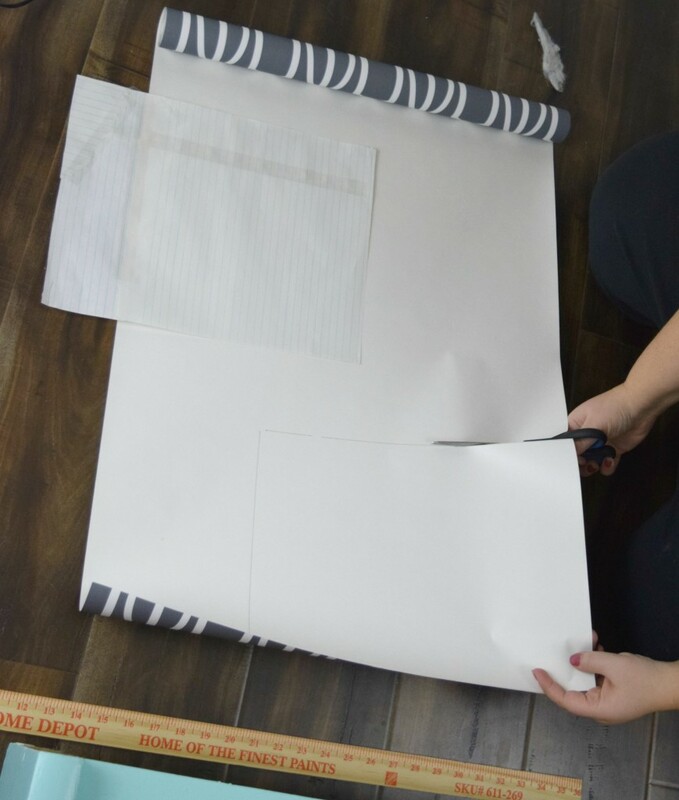 Once the fit was right push down the paper and smooth out any lines or spots. Now, weeks later it is not able to be peeled off at all. 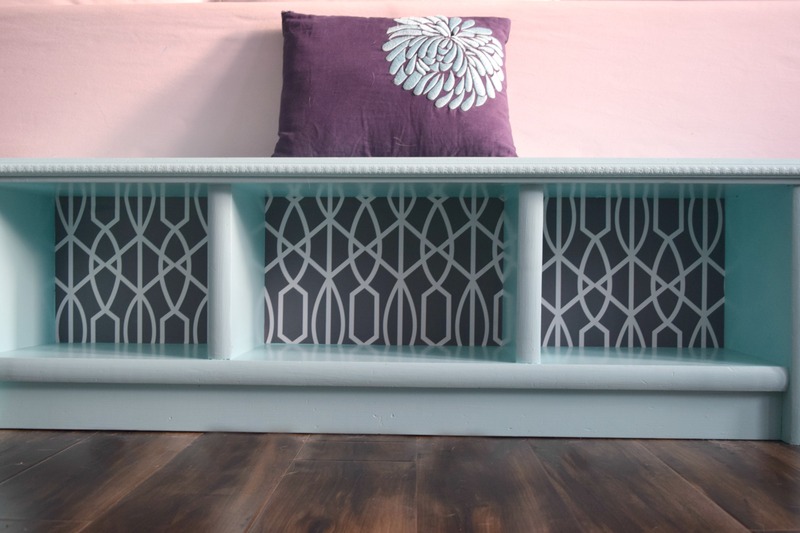 How to upcycle a bench, adding the details to this was a lot of fun. I get a huge impact with the final results and aside from the sticky portion of the paper being too sticky it was very simple to execute. 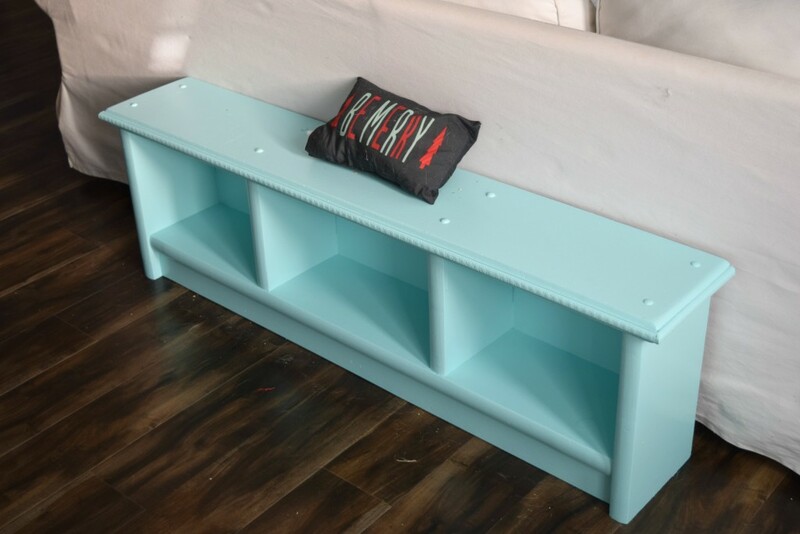 This bench can now be added to my furniture upcycles and redo’s that trick people into thinking I am finally working with that champagne budget. I honestly think even if I won the lottery (not that I played and had my winnings all planned out….) I would still enjoy the process of taking a tired and worn out piece and turning it new again. Laundry is what I would outsource, all of the laundry can be done by anyone but me. That is what my lottery winnings would have gone to. 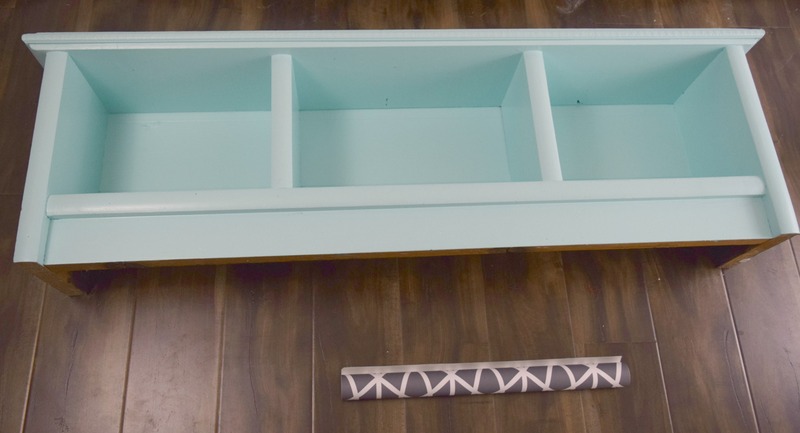 I can spend my days redoing furniture like this! 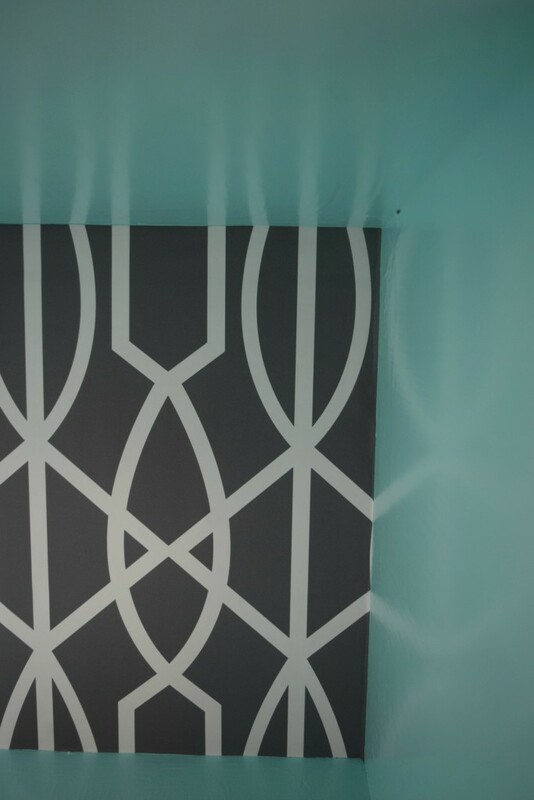 Adding these small details like the trim and the wall paper make this piece feel updated and custom. 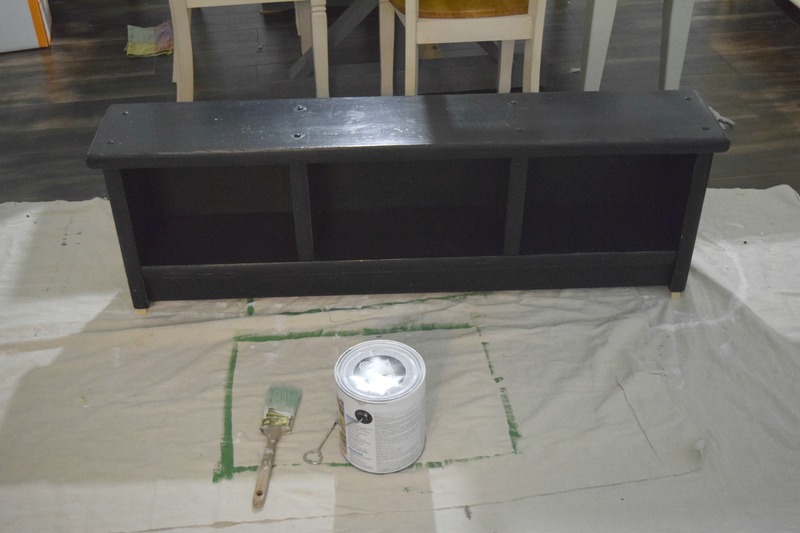 I purchased the bench for $6, with the other supplies of the paint, paper and trim I spent total just under $40. I won’t name names, BUT a bench like this in a big time furniture store would be a whole lot more than that. I don’t even think you can have furniture delivered for less than a $50 service fee. 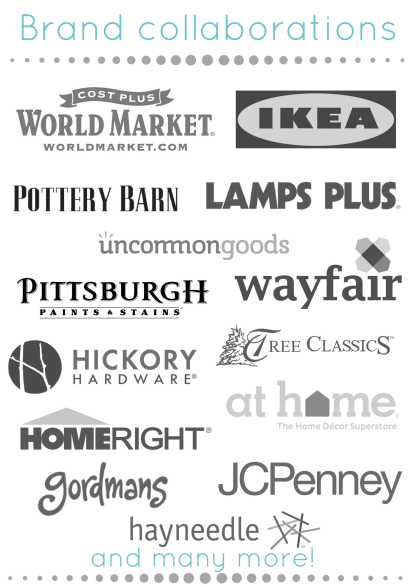 Nothing wrong with furniture stores or buying from there. I just want to show people they do not have to wait for their bank account or lottery to start making their dream home happen now! I love a doing mega home renovations, a new bathroom is wonderful, new tile in the laundry room is amazing. Let’s face it, just because I know how to lay tile down now does not mean I am eager to do it again anytime soon. But simple furniture redo’s are something anyone can do and I have furniture waiting in the wings that I will happily redo. A lot less labor intensive and a lot more instant results. As you can see, some members in our household think that furniture redo’s are tiring. Teddy and Finn needing to take an afternoon nap after all of that painting. 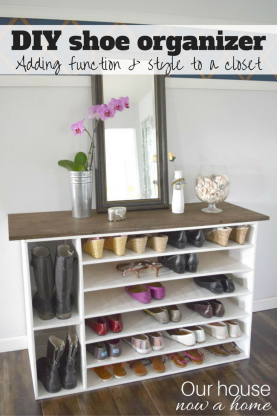 This is the entryway I was imagining! 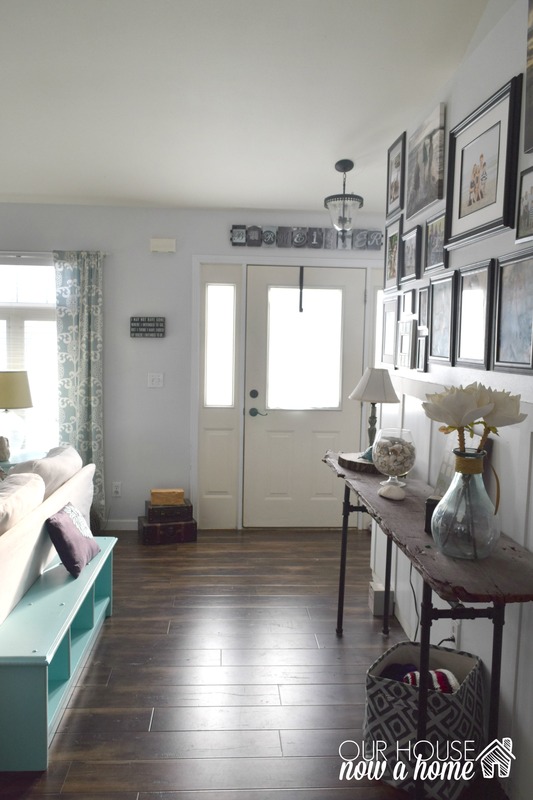 It has the rustic, country, but bold and coastal style. The perfect marriage to my dream home and to Dale’s, I want a beach house and he wants a log cabin in the country. We make it work with this bright, bold, casual, farmhouse look. I know for a fact that is not an actual style but it is ours and we adore it! This bench makes me feel happy looking at it now. 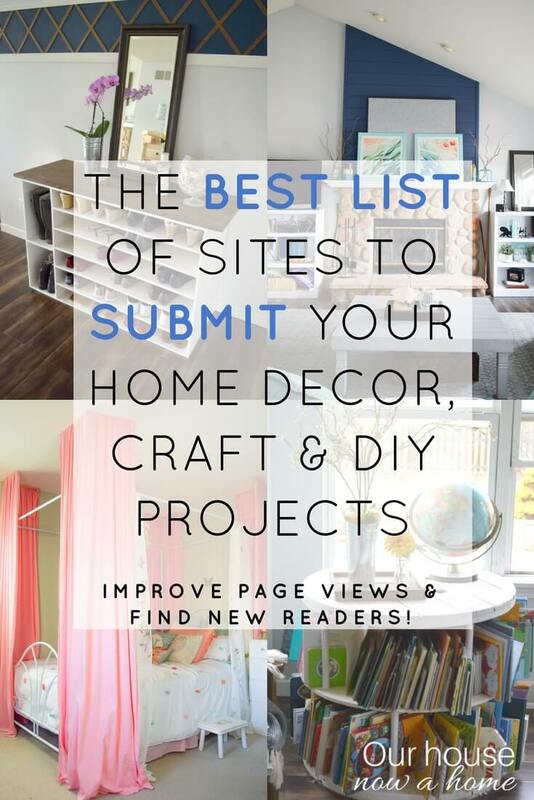 What can I say, I am either decorating, talking about decorating, taking pictures of decor, or planning my next project. Furniture starts to have personalities and this one is all about the happy feelings. 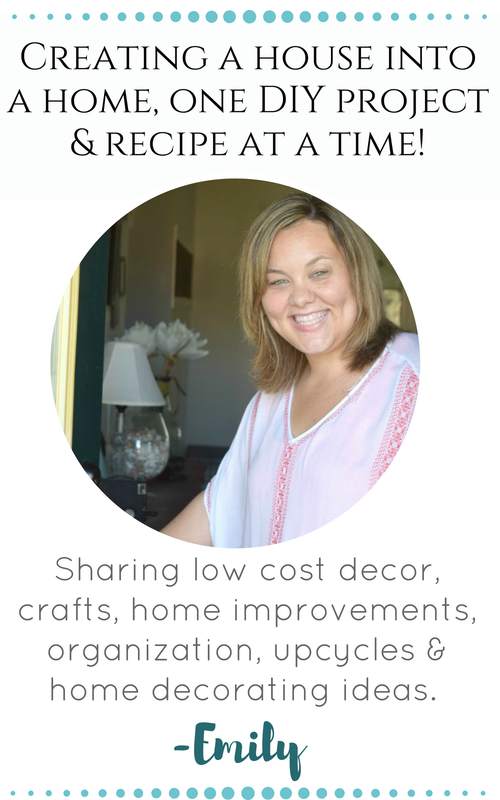 I hope you liked How to upcycle a bench, adding the details and found a few little nuggets of inspiration, ideas, or was just simply entertained. Either way, I am so happy to have you here talking home decorating with me. Otherwise I would be a lonely person with a very time consuming home decorating diary. You all make this enjoyable! 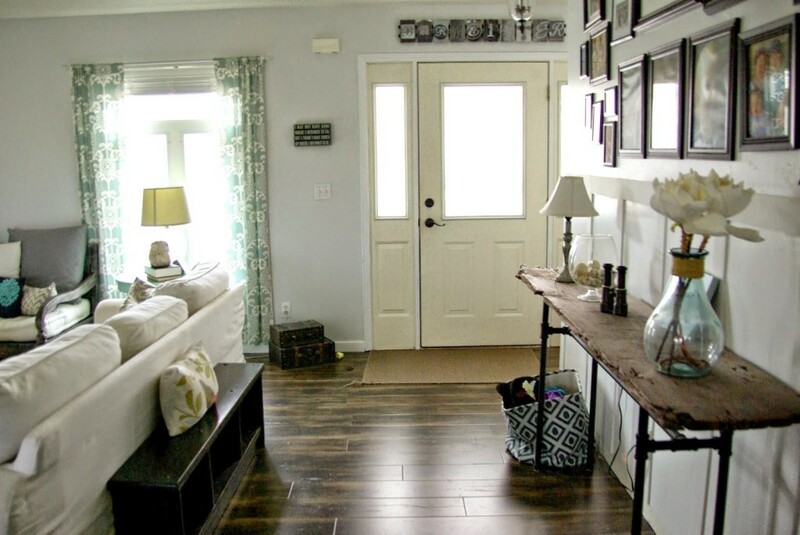 What do you prefer more of, large scale renovations or simple furniture redo’s and crafts like this? Tell me what you enjoy reading around here! Love the liner you used for this project! I hear you about not rushing things especially when it comes to painting furniture and making sure everything goes out right. I’d be scared of cutting the paper too! I’m always afraid I’d cut too much off. I enjoy little projects like this because it can all be done in a day! Great job on this bench re-do! The new color looks great in the walkway. Before it blended in with the console table and floor. Now it really pops! Love the trim and wall paper! Great idea to add that pattern in there. Thank you! I am loving that it stands out too! It looks so much better now. I love anything painted blue, or white! This turned out cute! The pattern adds a nice element to the piece. Nice selection. Thank you so much! I am hooked on this wall paper in the back of shelving now. Wow! You are so talented. I’m impressed with everything you can do. That color is pretty and suits that fabric so well! Thank you! It is my favorite color to decorate with.